1) Find the book you are hoping to borrow in WorldCat. 2) Click on the "Request through WorldShare" button. 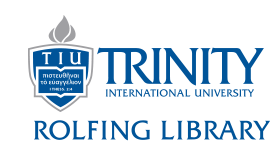 4) The book information will be filled in for you, but you will need to complete all the required fields, including your Trinity username (ex. zjsmith) and the "Need Before" date. 6) You will receive an e-mail once your book is available, and you will be able to pick it up at the circulation desk. 3) Change the Request Type to Loan. 4) Complete the required fields, including your your Trinity username (ex. zjsmith) and the "Need Before" date. If you live at a distance from the Deerfield campus, include in the notes field that you are a distance student. 5) You will receive an e-mail letting you know that your book is available, and you will be able to pick it up at the circulation desk.